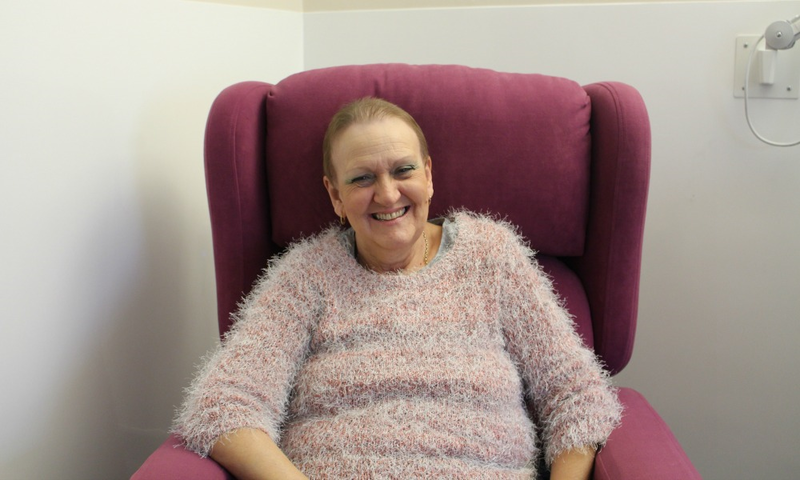 “I suppose like many people, I wasn’t fully aware of the services and care that St Catherine’s Hospice provides until I really needed them. Before coming here as a patient, I volunteered for St Catherine’s and helped with the afternoon teas on the weekends, and loved being a part of it all, until my arthritis meant I had to stop. For a while, my lung cancer went undiagnosed; I suffered few symptoms, but I was in a terrible amount of pain all of the time. There was a fair amount of to-ing and fro-ing between doctors and specialists until Halloween 2016, when I was admitted to East Surrey Hospital and various tests confirmed that I had a tumour. I knew that St Catherine’s Hospice would be the best place for me in terms of pain management. I just needed a referral. I had surgery to remove some of the tumour, but my pain wouldn’t subside and at home, I couldn’t cope. My GP referred me to the Community Nursing team at St Catherine’s, where a lovely nurse called Louise came out and spoke to me for two hours, getting to know me and my family, and talking me through my medication and how we could try and get my pain under control again. I was in the middle of chemotherapy and the pain was still unbearable: until one night, things got so bad that I called the St Catherine’s team in the early hours. This place saved my life. The team here have got me through some of the darkest days. Had it not been for them, I honestly doubt I’d be sitting here now, talking to you and sharing my story. After spending time in hospital, I was relieved to hear that I could come back to St Catherine’s. I had been put on very strong drugs that had made me feel awful and not myself at all. I had been spending days just sleeping, not remembering conversations and at times not even being able to tell anyone my name. As soon as I arrived at the Inpatient Unit, the Doctors spent time working out how to get me off the morphine and onto other medication that would help my pain but make me feel like the old Shirley again. And it worked; I was able to start making the most of my time again. It truly has given me my life back. Every patient here is treated as though you’re the only one; nothing is rushed, or too much trouble. Perhaps the greatest gift since I’ve been here has been the Therapies team; they’ve been truly wonderful, especially Mandy, Tiz and Claire, who really helped me with my breathing techniques when I first came to the hospice. With their help and guidance, I’ve gained confidence again, and have accepted my cancer as they’ve taught me how to deal with it through a mixture of exercise and mindfulness techniques. The thing about cancer is it’s not just your physical wellbeing that needs looking after: it’s your mental health too. When Tiz first suggested meditation to me, I was sceptical to say the least. I thought it was for hippies, and certainly didn’t think it would help me in any shape or form. I reluctantly agreed to a session with Graham, a volunteer at the hospice who practises meditation with patients, but didn’t expect it to do much. In fact, Tiz arranged for me to have a foot massage at the same time in the hope it would help me to relax! But I was wrong: it was amazing. For 45 minutes, I was able to forget about my anger, my upset and my fears, and just sit back and “be”. Now, I use meditation when I feel upset, am having a bad day or can’t sleep at night. I never thought it would be meditation that would help so much, but having that time to clear my head has been invaluable. Perhaps the best medicine is being around other people. Human beings need other human beings, and I’m so grateful that once I’ve left the hospice and gone home, I’ll be able to come back and make the most of the Day Hospice activities on offer, such as the Movers and Shakers class. It not only puts my mind at ease, but will help me to meet other people who are in a similar situation to me. That will be a real help. A couple of weeks ago, my son Craig came to the hospice to see me. After weeks of not feeling myself, that day I was sitting in my chair with my makeup on, and was laughing and smiling. Craig looked at me and said: “I’ve got my Mum back.” That’s all thanks to St Catherine’s. Without them, I wouldn’t be here today.